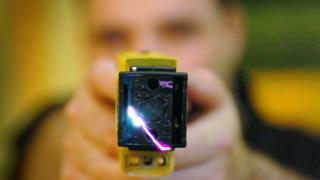 Police Scotland will increase its Taser capability by 500 officers after a sharp rise in the number of assaults. So far this year, 969 officers have been assaulted - an increase of nearly 27% on the 764 recorded in 2016. The plans, which will be put to the Scottish Police Authority (SPA), are aimed at improving public safety. The force also confirmed it is extending the role of Armed Response Vehicle (ARV) officers to allow them to be deployed to more non-firearms calls. Deputy Chief Constable Johnny Gwynne said the newly-trained officers will be based in all 13 local policing divisions. Mr Gwynne said: "Our officers are facing increasing threats of violence from people with knives and other bladed weapons. "We've also seen an increase in the number of officers attacked while carrying out their everyday duties. "We will shortly begin the selection process for around 500 conventional uniformed officers to be trained to carry Taser." The proposal follows an extensive programme of engagement with the SPA, politicians and other key stakeholders. The officers, who will start training in May and be operational by August, will be deployed in urban and rural areas. Mr Gwynne said extending the role of Armed Response Vehicle (ARV) officers to allow them to be deployed to more non-firearms calls would be a more efficient use of resources. ARVs currently deploy to firearms incidents, threat-to-life incidents or deal with anything they come across during the course of their patrols using their professional judgement. The removal of the current restrictions will also be presented to the SPA at a public meeting on Tuesday and will come into effect early in the New Year. Mr Gwynne said: "We have increased the number of ARV officers available in our communities but our current deployment model is inefficient. "It does not allow these officers to be sent by the control room to anything other than firearms or threat-to-life incidents. "They already respond to things they come across and are sent to other incidents where there's a threat to life but no firearms are involved." The officers are trained in advanced emergency first aid and have assisted in incidents, such as road traffic accidents, where they have reached the scene before an ambulance. They will also support national campaigns, targeting crimes such as drink-driving and speeding. In 2014, the appearance of armed officers on routine tasks sparked a row but Mr Gwynne said the force had learned from the experience. He added: "We are aware that in the past there have been some concerns about the role of armed police officers in our communities and that previously we have not engaged as well as we could have when making decisions about how they are deployed." In June last year the force announced an additional 124 firearms officers, including 99 dedicated to ARVs. David Hamilton, vice chairman of the Scottish Police Federation, praised the force for listening to the concerns expressed in a recent survey. He said: "The extreme violence and dangers police officers face on a daily basis are poorly understood by those outwith the police service. "Far too often police officers are seriously assaulted and injured when dealing with violent events. "Whilst not the panacea to all the threats we face, evidence from across the world shows Taser reduces such assaults and injuries considerably, and leads to safer outcomes for police officers, the public and offenders." Mr Hamilton said the force had a duty to ensure its members have appropriate safety equipment. He added: "We believe this announcement represents an awakening in the service that its obligations to the safety of its officers can no longer be set aside." Meanwhile, Police Scotland has confirmed it will buy new drones to use as alternatives to the force helicopter in rural and remote areas. The technology will mainly be used in the hunt for missing people. Extra cyber hubs will also be set up, as part of a £3.6m investment, to help specialists tackle the rise in internet-related investigations. Other elements of the plan, which will also be put before the SPA next week, include piloting a range of mobile devices for operational use and a public consultation on body cameras.